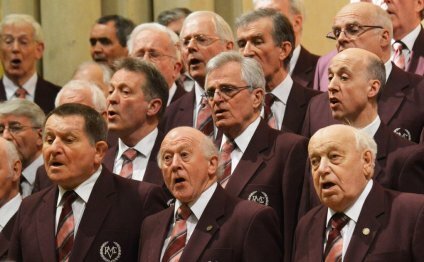 Every year Reading Male Voice Choir raises thousands of pounds for local charities over a wide area with a concert every month. We have links with choirs in Europe and usually tour abroad every two years. In recent years we have travelled to Düsseldorf, Innsbruck and the West Coast of Ireland. In June of this year we gave two concerts in south Devon. Among its many achievements are: winning the BBC’s national contest ‘Let the Peoples Sing’; joining the chorus of Die Fledermaus at Sadler's Wells and performing with the bands of the Parachute Regiment and Life Guards before audiences of 3, 000 at Cliveden. The eighty-strong choir loves to entertain and delights in expressing itself through a wide-ranging repertoire of memorable and moving songs. Off-stage the men enjoy an active social life. Wives and partners meet once a month and often invite guest speakers. GWYN ARCH MBE our President founded the Reading Male Voice Choir in 1971 and was the Musical Director until 2015. He was Director of Music at Bulmershe College of Higher Education until his retirement in 1985. A Composition Fellow of Trinity College, London, and a Licentiate of the Royal Academy of Music. He has composed hundreds of songs and choral works, particularlyfor both mixed and male voices. He is one of the most frequently performed arrangers of male choir music in the country. He examined for the Associated Board for ten years. Clive Waterman has spent his working life in education, focusing on children’s musical development. He served as a teacher/Head Teacher for 30 years, and during this time produced his first large scale concert, conducting a choir of 400 children from Woodley and Earley. Similar events soon followed for the children of Reading, Wokingham, Maidenhead and Ascot, and Windsor. He was also a trustee of Berkshire Maestros and conducted and arranged music for two highly successful percussion groups for teenagers. Currently he leads Wokingham Council’s ‘Music for All’ project which gives 800 children the opportunity to perform in major musical events each year. Since his student days (when tutored by Gwyn Arch). Clive has been accompanist, and later Assistant Musical Director for RMVC. For many years he also accompanied Reading Phoenix Choir under it's conductor Norman Morris, and Clive is delighted to now be assisted by Norman’s daughter Lucy. Lucy Joy Morris our deputy musical director graduated from Queens’ College, Cambridge in June 2015 where she was a senior scholar on the Conducting Programme. As a student, Lucy conducted the Cambridge University Wind and Concert Orchestras as Assistant Conductor for the University Music Society. She also conducted the MagSoc Chorus and Symphony Orchestra in performances in West Road Concert Hall, and was the Musical Director of Bernstein’s ‘Candide’ for the University Opera Society in her final year. She currently assistant conducts and leads sectionals for the National Youth Choirs of Scotland and Great Britain and has most recently taken up the position of conductor for the Taplow Boys’ and Children’s Choirs.